These red flowers are lovely in the original but I thought giving them a slightly pink, gold sepia tone would give them a wonderful effect. I brightened the photo a bit before I added the sepia effect using Hue/Saturation in Adobe. Next week I thought we'd take some time to show you how to colorize a sepia photo. I'm looking forward to it. 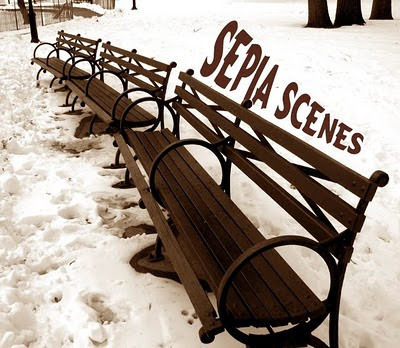 Don't forget to sign Mr. Linky, leave a comment and VISIT your fellow Sepia Scenes bloggers. Our thoughts go out to the Haitian people and the devastating earthquake that hit their country yesterday. Help is on the way according to President Obama. Aw, those are nice flowers. A character in one of my stories is a florist in the 1800s. This photo sort of took me into her world a little. Hehe. Ooo, I'd like to learn how to colorize a Sepia. That'd be cool. Looking forward to next week. they look like straw flowers--I like the brightness of the picture. A lovely picture. I love sepia more and more. Your flowers are really beautiful in sepia. Those flowers really looks beautiful like that! The ivy and baby mums make me think of invading armies. The ivy is climbing, the mums are gather and pushing back. Does give them an old-world kind of feel... Flowers often don't translate well to monochrome, but these do okay. Sepia seems to heighten the texture of the flowers, so you get a feel for the buds. Old-fashioned mums in sepia - I like it! Hi Mary. I was thinking. Red flowers, hmmm. If you convert to monochrome using the color filter method with a red filter, the flowers would be white and add lots of contrast. When I make my conversions, I always play with the different colored filters until I find the one I like. You might want to try this technique yourself. Nice photo. I did flowers today too. I had this post in mind last week. Mental telepathy? Another beautiful setting in sepia. I remember gazing at Long Island from Rye (Playland's pier) last September. The sound was so peaceful. I posted a sepia photo today and thought I's look into sepia scenes since I have seen in on a few blogs out there, so I posted my link too. 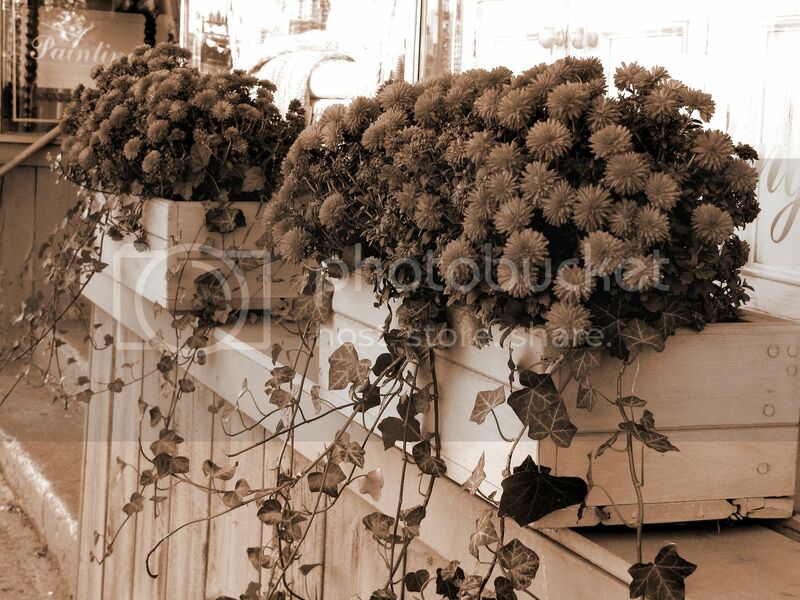 These mums look really pretty in sepia tone. I think you may have posted them for RT once? Je vois qu'on parle Francais ici. C'est bon! What a tragedy- hundreds of thousands may have been killed. Lovely flowers! Can't wait to see those in its real color. What a beautiful row of flowers! I like the hanging leaves most..
Crysanthemums? I love the pink - gold tone. It's beautiful! Looking forward to the sepia colorization lesson. ever though of using www.Inlinkz.com instead of mr.linky? It's an alternative tool, free, stable easy to use AND it also displays thumbnails of the submissions. Check it out and you'll love it! For examples check this page http://www.inlinkz.com/testBed.php and feel free to contact me!